Hart of Dixie Discussion & Speculation: Where Are We Headed? Hart of Dixie has kicked off its third season and we're on a good start to another fantastic season of Hart of Dixie. 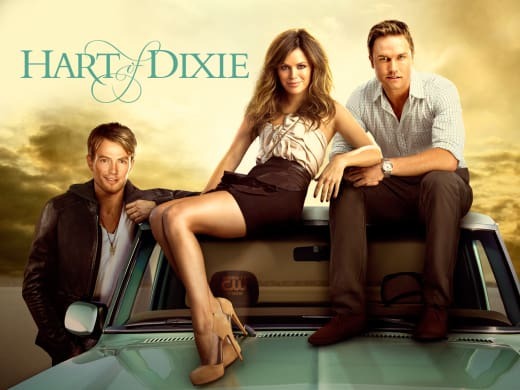 When I'm not writing for TV Fanatic, I am co-running the largest Hart of Dixie fansite: Hart of Dixie TV. Since we have such a large fan base on Twitter and on Facebook, TV Fanatic and Hart of Dixie TV came to together to get the fans more involved in the show. As a result we've coordinated a "Dixie Discussion" on Facebook and we received many responses. We all discussed Bluebell's newest residents and where we see Zoe and Wade headed. Read below to find out our hopes and our predictions as the fans of Hart of Dixie get a chance to let everyone know how Hart of Dixie Season 3 compares to Hart of Dixie Season 2 . First up, Linley. The newest Bluebell resident who is about to stir up some major drama with George and Lavon. To refresh your memory in Hart of Dixie Season 3 Episode 2, it was revealed that she had a one night stand with George. Now, George is stuck tutoring her. "I'm not a fan of the way she acts, so maybe there will be a good storyline that explains why she acts like that." - R. Canvender. "Annoying, desperate, definitely NOT George Tucker worthy" - J. Cullen. What will happen when Lavon finds out about their one-night stand? Lavon is going to be angry because George lied to his face. Really though, Lavon is incredibly niave. I hope Linley helps him lose some of that. Next up, Joel. Another new resident not only to Bluebell but to Zoe Hart's heart. Joel is the nerdy New Yorker who enjoys writing, plays, Game of Thrones, and is allergic to everything under the sun. Everyone mostly agreed that he isn't going to last very long. Unfortunately, I agree. He's adorable and works for now, I give him a few more episodes. Onto the golden couple of the series, Wade Kinsella and Zoe Hart. They've fought their feelings, had a relationship, left with broken hearts, and now are "friends" while Zoe dates Joel. Is this really going to last? Can George Tucker get some love? No, really, can he? Zoe Hart broke his heart twice, Tansy left him, and now he has a crazy stage 5 clinger (Linley). "I hope finds someone he can be with. I also want them to leave Zoe and George alone. He needs a different lady" - S. Cash. I bet the reason he isn't getting any love is because he needs a dang haircut! This season is officially being renamed, "The Season of Lemon" - so far we've seen her run a bar, sleep with Meatball, hook Robert Buckley, and quit the Belles. Is there anything Lemon won't do this season!? From day one, I've always said she'd be the one to grow the most out of anyone on this show. I hate being right. How does Hart of Dixie Season 3 compare to Hart of Dixie Season 2 so far? Finally, this season is just starting and it has so much potential already. Where is Hart of Dixie headed from here? "I would like Joel to go back to New York." - J. Campbell"
I can definitely see Robert Buckley returning as Peter. Joel won't last very much longer and Zade is endgame. I want to continue to see Lemon be successful, everything else can go to crap but as long as Lemon is all good, then so am I.